A major brewery in the United States was reluctant to address flaws with its process system insulation until corrosion of the pipes became so significant that production was affected. The daily wash-down of the food-grade system made the permeable insulation used at the time progressively wetter, leading to significant corrosion of the above-ambient piping system. Insulation specialists helped the brewery rewrite its specifications around non-permeable insulation to minimize the chloride transfer to the surface of the steel and increase the system’s insulating factor. In another case, an 8-foot diameter vessel holding liquid used for process control, operating at –22 F with surface emissivity of 0.9 and an ambient temperature of 60 F, was insulated with 6-inch-thick open-cell insulation. The anticipated heat flow was <3 Btus/hour/square foot, but the system failed due to moisture intrusion and instead experienced heat transfer at a rate of 45 Btus/hour/square foot—15 times what was anticipated. The vessel was re-insulated with 4-inch non-permeable cellular insulation, and the energy transfer was reduced to the specification of <3 Btus/hour/square foot. Because of the challenges involved, breweries insulated according to outdated or non-climate–specific specifications may see significant or total failure of the insulation system in a very short period of time. In a brewery, the most important insulation concerns are preventing water intrusion either in liquid or vapor from resulting in stress crack corrosion, followed by improving process control and energy efficiency. A unique aspect of the brewing process is the frequent wash-down of the insulated systems using a mild caustic solution at 190 F. If the solution permeates the insulation, there will be significant energy loss (due to the conducting properties of water) and thus a significant reduction in the system’s overall performance. One obstacle is the near constant high humidity inside a brewery, making it harder to overcome water vapor transmission since it is harder to dry out insulation if it becomes wet. Furthermore, the solution used in the wash-down (with a high pH level) causes corrosion of the stainless steel piping when the two come into contact—especially on the susceptible stress areas, which are created during normal manufacturing. 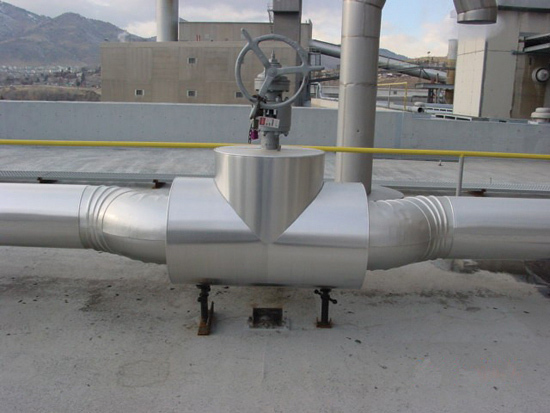 This challenge is very specific to stainless steel applications, as there is more impact on this type of piping than on others. Almost exclusively, breweries use austenitic stainless steels for process piping. In recent years, steel mills have been able to control more accurately the amount of nickel and chrome (the two most expensive additives) in stainless steel, resulting in a reduction of these metals in stainless steels—leaving them more susceptible to stress crack corrosion. Because of these factors, breweries find it beneficial to employ a closed-cell, non-permeable, waterproof insulation covered with stainless steel jacketing and waterproof joint sealant. This improved system was designed in response to moderate to serious insulation failures in breweries. 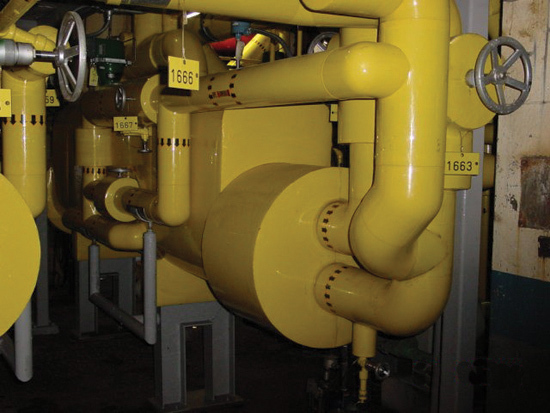 With outdated or improperly specified systems, water was reaching the piping for various reasons—improperly sealed jackets, poor maintenance, damaged jacketing, and failure of vapor barriers. A 1.5-inch diameter pipe with 1-inch-thick insulation, operating at –20 F, was rated to gain 11 Btus/hour/square foot. The porous insulation, which had become wet, was not performing properly. PCC testing revealed that the pipe was gaining 65 Btus/hour/square foot—nearly six times the energy loss for which it was rated. The pipe was re-insulated with non-permeable 1-inch-thick cellular material, and subsequent testing showed that the energy loss had been reduced to less than 9 Btus gained/hour/square foot. Freeze protection is sometimes a concern inside brewery facilities. For example, several major breweries utilize cold lines that carry an ammonia-based coolant at –28 F. These cooling lines have to be insulated to keep ice from forming on the pipe exteriors, which is important because ice on the line robs the system of energy many times more efficiently than air. Personnel safety is also a factor. When lines are that cold, moisture condenses out of the air into ice on the piping and creates a physical hazard (risk of falls). It also can freeze employees’ skin if left bare. The bottom line is that these coolant lines must be insulated for condensation control and vapor protection, or ice will form. Most attachment devices (hangers or supports) have to be insulated as well. Insulating against freezing temperatures also is necessary for outdoor pipes between buildings. The pipes, which are on racks, transfer beer-making liquids between buildings. They are insulated against the outdoor temperatures, as well as weather, wind and traffic (maintenance factors). Because they do not require the daily wash-down, outdoor joint sealant and jacketing can have different specifications than the indoor piping. Aluminum jacketing, for example, often replaces the stainless steel used indoors. Temperature control is an important consideration for breweries. In a brewery, fermentation and conditioning processes must happen within a narrow temperature range. The production requires a system that can keep those processes near the specified temperature points, which vary from brewery to brewery. Water vapor transmission is again a major concern, because it greatly reduces the effectiveness of the insulation. A 1.5-inch diameter pipe with 2-inch-thick rigid insulation, operating at 230 F, was rated to lose 14 Btus/hour/square foot. Instead, the energy loss was 125 Btus/hour/square foot. The primary reason for this was water intrusion and jacket failure. The end result: the insulation system was replaced with 2-inch-thick cellular material and re-jacketed. Its energy loss was reduced to 10 Btus/hour/square foot. Regardless of the particular application, says PCC territory sales representative Rob English, who has been in the industry 16 years, it is important for end users to look into energy analysis programs to determine the necessary type and economic thickness of insulation. In the case of brewery applications, PCC uses their in-house Energy Analysis Report (EAR) software to help end users determine their system’s level of performance efficiency. It is similar to the 3E Plus® program created by the North American Insulation Manufacturers Association (NAIMA), but unique to their products’ specifications and uses more complicated modeling formulae. Once the economic thickness is determined, it is relatively simple to determine how to control the temperatures. An energy analysis determines how much energy will be used under the specific conditions. The initial insulation system design must make allowances for the spacing, as well as the size, of hangers and supports, taking into account the type of insulation being used and the methods of sealing it to keep moisture out. When planning a new insulation system or improving an existing one, owners and operators need to learn as much as they can about the options available in order to determine the most effective and efficient system possible. Knowing right material for the right application will save money and time over the long run because there will not be the necessity of replacing an insulation system that was improperly specified from the start. System installation is a critical part of this process. Obtaining accurately fabricated goods from qualified fabricators, and quality installation practices from experienced contractors, will allow brewery operators to achieve the maximum lifecycle and performance from the specified insulation system. Cold system owners and operators should consider doing follow-up energy surveys on a periodic basis to check how the cold systems are performing. 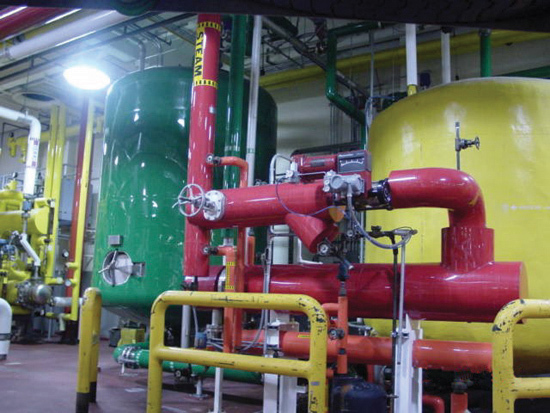 PCC provides energy surveys through NIA-certified energy appraisers who take a comprehensive look at the systems inside a brewery, including heat flow in piping and in vessels, ammonia systems, CO2 systems, wort lines, chilled water systems, and propylene glycol thermal transfer fluid. Along with energy surveys, consistent maintenance practices play a role in long-term performance—e.g., if ports are cut for non-destructive tests, they should be repaired promptly and correctly, as should jacketing perforations and moisture leaks. An entirely separate consideration is reduced contribution to fire. As insurance companies place more importance on reducing facilities’ fire liability, the flame spread and smoke development properties of insulation material needs to be examined carefully. ASTM Standard E-84 (E119) rates insulation materials on how they burn. Materials should be rated at least 25/50 flame/smoke, with a goal of 0/0. Currently, only a handful of materials meet this. In particular, hot oil systems and those heating with thermal transfer fluid need something that will not contribute to or support combustion. In working to reduce the susceptibility of a structure, more areas (e.g., vessel skirts or supports) are being insulated for the sole purpose of reducing the potential fire damage. This is especially important in light of the lessons learned from 9/11, when steel supports failed due to intense heat. The longer that steel can be kept from heating, the better the chance of reducing damages to a building. Insulating with an appropriate material can greatly reduce a vessel or structure’s susceptibility to fire. Closed cell materials are ideal for below ambient applications where high humidity, and wash-downs are prevalent such as a brewery. Rooftop brewery piping with aluminum jacketing.